Did changes in Crandall Canyon mining plan boost cave-in risks? Robert Murray, right, chief executive of Murray Energy Corp., right, stands behind Richard Stickler, Assistant Secretary of the Dept. 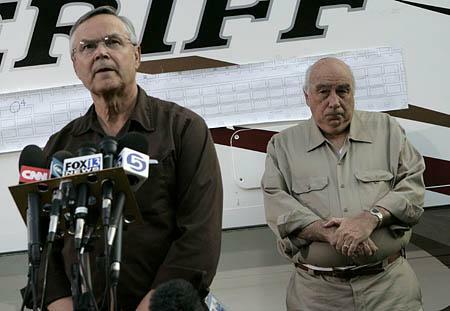 of Labor and director of Mine Safety & Health Administration, during a news conference at the entrance to the Crandall Canyon Mine, in northwest of Huntington, Utah on Monday, Aug. 20, 2007. The once-outspoken Murray had been noticeably absent from meetings with relatives and from news briefings since three rescuers were killed last week in a tunnel collapse. Robert Murray insists that his company did not change the mining plan at Crandall Canyon after purchasing a joint interest in the mine last August. But documents obtained by The Salt Lake Tribune clearly contradict Murray's assertion, and show that Murray's company sought and received approval from federal regulators to make a significant, and, experts say, risky change to the mining strategy. Records of the Mine Safety and Health Administration (MSHA) show that, after Murray acquired a 50 percent ownership in the mine on Aug. 9, 2006, his company repeatedly petitioned the agency to allow coal to be extracted from the north and south barriers - thick walls of coal that run on both sides of the main tunnels and help hold up the mine. That stands in stark contrast to statements Murray made Monday asserting that his company's mine plan, and that of the previous owner, were one and the same. "Some have incorrectly reported that after I bought the mine I changed the mining plan. That is not correct," Murray said. He said the mining plan was developed by its previous owners, Andalex Resources, in conjunction with the Colorado mining engineering consultant Agapito Associates and approved by MSHA. Documents on file with the Utah Division of Oil Gas and Mining show Andalex had previously decided not to mine those barriers, determining it posed a risk to worker safety. "Although maximum recovery is an important design criteria, other considerations must be looked at in the final analysis in the extraction of coal. These factors consider the insurance of protection of personnel and the environment," the company wrote in April 2005. "Solid coal barriers will be left to protect main entries from mined out panels and to guarantee stability of the main entries for the life of the mine." In the Crandall Canyon mine, sprawling sections to the north and south of the main tunnel had been longwalled, where coal was cut out leaving behind nothing but rubble and no roof support. That creates pressures on the main tunnel that the barriers are designed to help manage. It was those barriers that Murray's company sought to mine when it asked MSHA to approve a change to the mine plan on Nov. 11, 2006. MSHA officials spent just seven business days reviewing the request before approving the mining in the north barrier. "There was a change of philosophy there," said Tony Oppegard, a former MSHA attorney and Kentucky mine official. "It's certainly very questionable. They wanted to get as much coal out of it as they can." Calls to the company's attorney and spokesman Michael McKown were not returned Tuesday. In February and March, the company did "retreat mining" in the north barrier, a practice that involves cutting away the remaining support pillars to extract the last coal deposits, leaving the roof to fall in. "It's a significant change in terms of pillars or no pillars or robbing the pillars," said Jerry Tien, a mining engineering professor at the University of Missouri-Rolla. "Bob Murray may have been more aggressive based on his experience in the east which may not be applicable here." Work in the north barrier progressed until March, when the mine suffered a major "bump" - a jolt in the mine caused by the pressure of the mountain bearing down, often causing the roof to fall in, floors to heave or coal to explode from the support pillars. The March bump damaged tunnels over a span of more than 700 feet, and prompted mine operators to abandon their retreat mining in the northern barrier. Instead, they asked MSHA for permission to mine the south barrier, armed with an Agapito memo that said using wider supports to add roof support should enable it to be mined safely. In May, the company asked MSHA for approval to begin cutting away those support pillars, which was approved by the agency on June 15. Six miners - Kerry Allred, Don Erickson, Luis Hernandez, Juan Carlos Payan, Brandon Phillips and Manuel Sanchez - were working in that south barrier on Aug. 6, when another major mine bump caused a massive cave-in, trapping all six inside. Murray conceded Monday that the six are unlikely to be found alive and it is possible they will be entombed permanently inside the crumbled mine. Three members of a rescue crew - Dale Ray Black, Brandon Kimber and Gary Jensen - were killed in another cave-in Thursday. Tien notes that the managers at the mine were experienced, Agapito is a respected firm, and the mining plan was approved by MSHA, but things still went wrong. "That area, geotechnically, it's pretty challenging, we all know that. But the people who are mining there are also pretty experienced," Tien said. "You make a professional judgment and things turn out to not be what you think." * Documents on file with the state in April 2005 say "solid coal barriers will be left" to protect Crandall Canyon mine workers. * Robert Murray's company, UtahAmerican Energy Inc., purchases Andalex Resources, including Crandall Canyon, the following year. * UtahAmerican asks MSHA to approve mining in the north barrier on Nov. 11, 2006. Approval granted seven business days later. * Maps show retreat mining, or pillaring, was done in the north barrier in February-March. * UtahAmerican asks MSHA to approve mining in the south barrier Feb. 23. * A month later a major "bump" damages a large area in the north barrier, prompting operators to abandon area. * MSHA approves UtahAmerican's request to do pillaring in the south barrier June 15. * An enormous "bump" in the mine causes a massive cave-in, trapping six miners on Aug. 6.